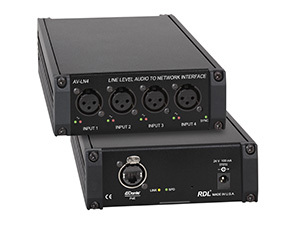 ﻿The AV-LN4 is an interface that converts four line-level XLR inputs to Dante network audio channels. Special software is not required to configure the AV-LN4. A dual-LED VU meter displays the level for each. 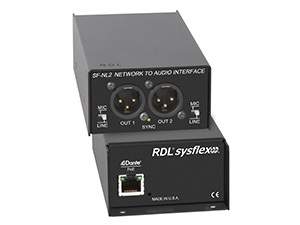 The AV-LN4 is a professional grade product for studio quality fidelity and low noise performance. 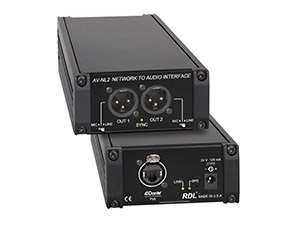 The AV-NH1 is a headphone amplifier that converts two Dante network audio channels to a stereo headphone output with front-panel level adjustment. 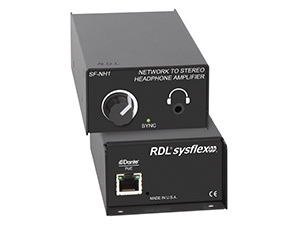 The outputs connect through a stereo 3.5 mm Mini-jack or ¼” (6.35 mm) jack. Each channel provides 100 mW into 100 ohms for a network digital audio level of 0 dBFS. 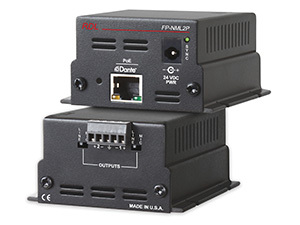 Special software is not required to configure the module. The AV-NH1 is a professional grade product for studio quality fidelity and low noise performance. The AV-NL2 is a line-level interface that converts two Dante network audio channels to two balanced audio outputs on XLR connectors. Each channel provides +4 dBu balanced for a network digital audio level of -20 dBFS. 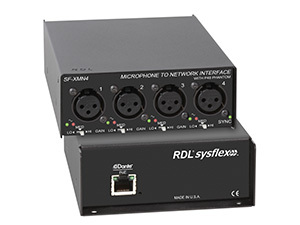 Each output is equipped with a selector to set the output to line level or attenuate the output by 50 dB to mic level. 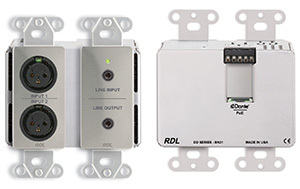 Special software is not required to configure the module. The AV-NL2 is a professional grade product for studio quality fidelity and low noise performance. The AV-NL4 is a line-level interface that converts four Dante network audio channels to four balanced audio outputs on XLR connectors. Each channel provides +4 dBu balanced for a network digital audio level of -20 dBFS. 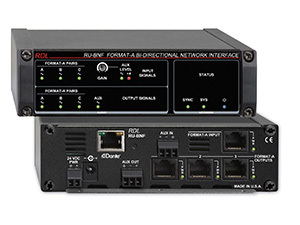 Each output is equipped with a selector to set the output to line level or attenuate the output by 50 dB to mic level. 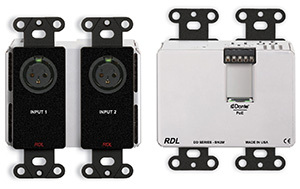 Special software is not required to configure the module. The AV-NL4 is a professional grade product for studio quality fidelity and low noise performance. 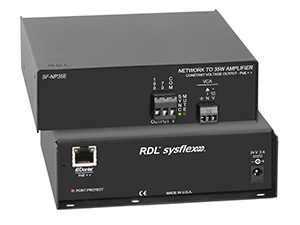 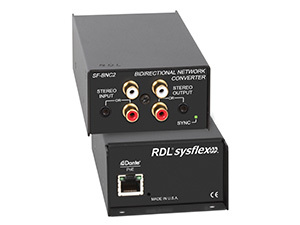 The RU-BNF modules are Dante audio network interface products compatible with RDL Format-A twisted pair products. 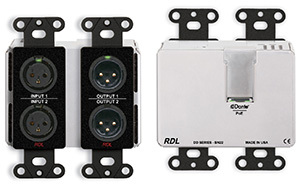 These modules are designed to be mounted in equipment racks, closets, conference tables and on shelves or backboards in commercial/industrial installations. 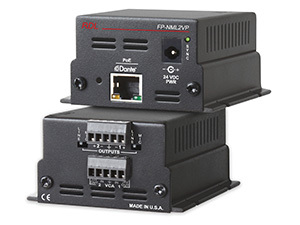 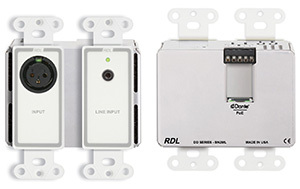 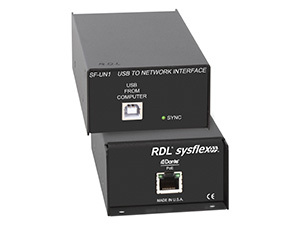 The RU-FN modules are Dante audio network interface products compatible with RDL Format-A twisted pair products. These modules are designed to be mounted in equipment racks, closets, conference tables and on shelves or backboards in commercial/industrial installations. 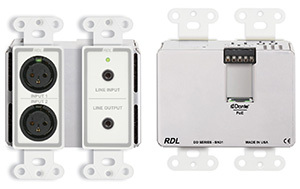 The RU-LB2 modules are Dante audio network interface products compatible with line-level audio equipment inputs and outputs. 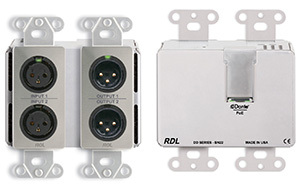 These modules are designed to be mounted in equipment racks, closets, conference tables and on shelves or backboards in commercial/industrial installations. 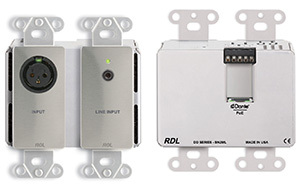 The RU-LB4 modules are Dante audio network interface products compatible with line-level audio equipment inputs and outputs. These modules are designed to be mounted in equipment racks, closets, conference tables and on shelves or backboards in commercial/industrial installations. The RU-MLB2 modules are Dante audio network interface products compatible with microphones and line-level audio equipment inputs and outputs. These modules are designed to be mounted in equipment racks, closets, conference tables and on shelves or backboards in commercial/industrial installations. The RU-MLB4 modules are Dante audio network interface products compatible with microphones and line-level audio equipment inputs and outputs. 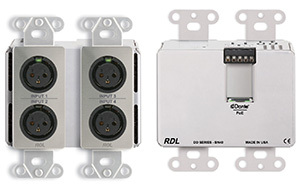 These modules are designed to be mounted in equipment racks, closets, conference tables and on shelves or backboards in commercial/industrial installations. 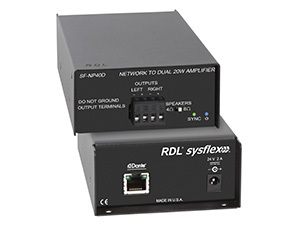 The RU-NFD modules are Dante audio network interface products compatible with RDL Format-A twisted pair products. These modules are designed to be mounted in equipment racks, closets, conference tables and on shelves or backboards in commercial/industrial installations. The SF-NP16E is an audio power amplifier that converts one Dante network audio channel to a 70 V or 100 V constant voltage amplified output. The output provides 16 watts for a network digital audio level of 0 dBFS. 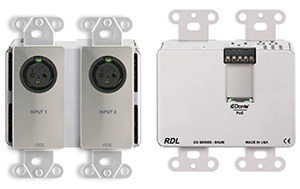 Special software is not required to configure the module. The SF-NP50A is an audio power amplifier that converts one Dante network audio channel and one analog input to a 70 V or 100 V constant voltage amplified output. 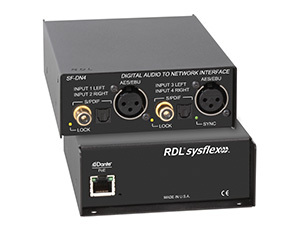 The output provides 50 watts for a network digital audio level of 0 dBFS. 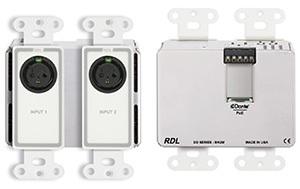 Special software is not required to configure the module.